This is only the second time I’ve taken part in Top Ten Tuesday (hosted by The Broke and the Bookish). I enjoy reading other people’s weekly lists but never seem to have time to put my own together. When I saw that this week’s topic was The Last Ten Books That Came Into My Possession I thought it might be an easy one to join in with as I’ve acquired quite a lot of new books recently! 1. Dacre’s War by Rosemary Goring – This is the sequel to After Flodden which I read last year. It’s been getting good reviews and I’m looking forward to reading it. 2. Kit by Marina Fiorato – I received this from Bookbridgr for a blog tour. I’ve previously enjoyed two other books by this author and can’t wait to start this one. 3. The Storm Sister by Lucinda Riley – The second book in Lucinda Riley’s Seven Sisters series. I loved the first one and am hoping this one will be just as good. 4. 1066: What Fates Impose by G.K. Holloway – I was offered a copy of this book by the author and as this is a period of history I’m very interested in at the moment I was pleased to accept. 5. Daughter of Siena by Marina Fiorato – The day after I received the copy of Kit I found another of Marina Fiorato’s novels in the second-hand bookshop. 6. Queen of Silks by Vanora Bennett – I’ve read one of Vanora Bennett’s other books (Midnight in St Petersburg) and wasn’t sure if I really wanted to read any more of her work. This one is set during the Wars of the Roses, though, so when I saw a cheap copy on the shelf I couldn’t resist! 7. The Love Knot by Elizabeth Chadwick – I love Elizabeth Chadwick so I was pleased to find one of her books that I haven’t read yet. 8. The Odd Women by George Gissing – I downloaded a free copy to my Kindle as this is one of the books I’m planning to read for my Ten from the TBR project. 9. Imperium by Robert Harris – This is set in Ancient Rome which is a period I’ve been wanting to read more about. I have already read the first two chapters and am enjoying it so far. 10. Fortune Made His Sword by Martha Rofheart – I don’t know much about this historical novel from the 1970s, but it was free on Amazon last week so I thought it would be worth downloading. Well, they are the last ten books that came into my possession! Have you read any of them? And have you acquired any interesting new books recently? Weirdly enough, I haven’t even heard of any of these! I hope they’re good, though, and that you love them all. I can’t wait to start reading Kit. It does sound good! Great list, I haven’t read any of them but I am looking forward to your reviews. I love historical fiction and it seems to be prominent in you list. I got 7 books from a second book shop at the weekend and for once it was historical fiction heavy (although I love it, I do not read it enough). Happy reading. Thank you. 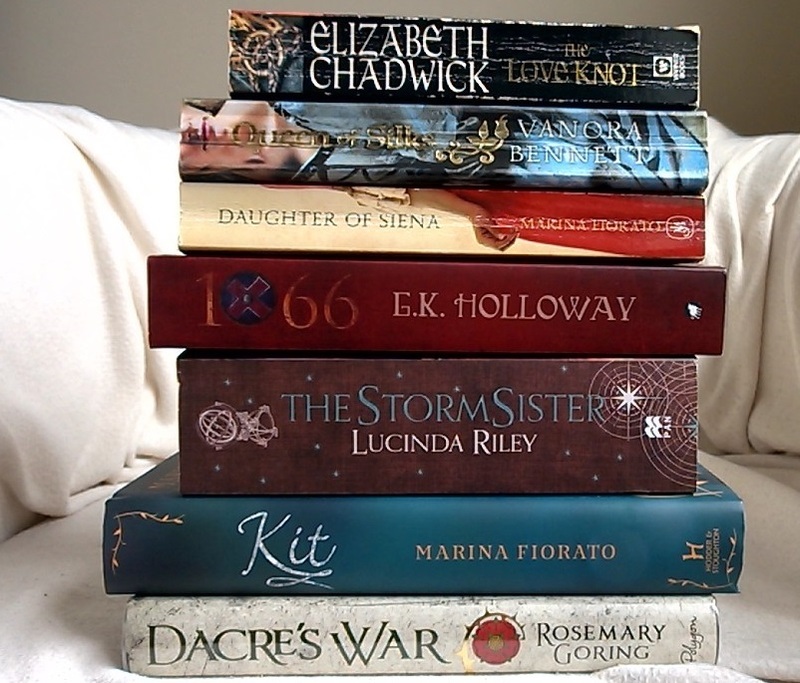 Historical fiction is my favourite genre, so I’m looking forward to reading all of my new books! Martha Rofheart! I haven’t thought of her books in years, but once upon a time I loved them, and I think this one was the first I ran across. I was on a Henry V kick at the time. I look forward to seeing your take on it. I haven’t come across Martha Rofheart until now so I’m pleased to hear something positive about her books! I’m looking forward to reading it. Helen, you’ve got some really interesting books here. Sadly I haven’t read any of them to comment. I will be very interested to hear your thoughts on Imperium by Robert Harris; as we’ve discussed Ancient Rome is a time period I would like to read more about too. I’m halfway through Imperium now, so you shouldn’t have to wait too long to hear what I thought of it! I got my copy of The storm sister, I am going to read it on my three week holiday from work. I simply cannot wait. I had a feeling you might be reading The Storm Sister as well! Hope you enjoy it.